SOME FRIENDSHIPS ARE BETTER LEFT IN THE PAST. Ok! Where do I even begin? This book was such a wild ride. The who's, what's and why's never stop and after a while you begin to question your own sanity. Just when you think you have the slightest inkling of what is happening, Louise Jensen throws you into another direction. Spinning what you "thought" you know completely upside down! This is my first book by Louise Jensen but it will NOT be my last! I have already ordered my copy of The Sister and cannot wait to dive into it. I was completely entranced by The Surrogate. It held me tightly in its grasp from the very beginning and still has yet to let me go even though I have turned the last page. Louise Jensen has proven to me, with just this book, that she is a mastermind at psychological thrillers. She penned such a suspenseful thrill ride that had me flying through the pages at a fervent pace. The Surrogate is delivered in Kat's perspective but also has 'Now and Then' segments that hop back and forth between Kat and Nick. Louise Jensen crafted this aspect beautifully. Not once do you ever get confused or need to backtrack. Each character also stands so strongly. The Main cast appears to be Kat and Nick yet all of the secondary characters play a major role in this novel. Each one has a vital part in the strength of this story and the entire package of the novel. 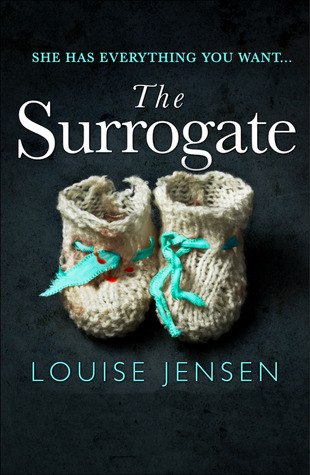 The Surrogate will have you questioning every relationship and motive and the sincerity of people. Should you rekindle that friendship or leave the past behind you? I thoroughly enjoyed every minute of The Surrogate and cannot wait to dive into Jensen's previous and future work. She is a real gem in the literary world and will have you on the edge of your seat in nail-biting suspense! Very intriguing description. You know how to make everyone quit and run to read book. I like stories, where there are games with the mind. They help to look into the hidden corners of the human soul, understand man's nature and even draw psychological conclusions. Thank you for the review, I will definitely read this book!